This week I’m finishing up an article for a Los Angeles healthcare magazine about youth sport injuries. When I first started this article, I had no idea that it would haunt me as much as the articles I wrote earlier this year on stressed out kids and childhood diabetes. There seems to be an invisible link fueling these three varying topics and intuitively it has to be our American culture. We are a society stewing in a pressure cooker of stress: too many obligations, long work hours, financial strain and the need to succeed. Of course our children feel this pressure cooker environment every bit as much as we do—perhaps more so. And they are navigating through it as best they can. This week I listened to two well-known orthopedic surgeons in Los Angeles explain to me the type of injuries they treat in patients as young as 8. Can you imagine ACL surgery at 8? 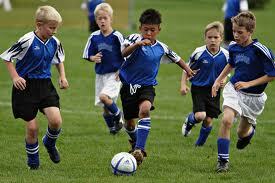 But think about it, some children start group sports or club sports as early as 5 or 6. I learned an interesting tidbit from one physician who works with elite athletes…that baseball scouts aren’t as interested in signing pitchers from California anymore. Want to know why? Because Californians are known to work out longer and harder year-round. Our athletic culture, mixed with coaches and parents who like to take advantage of the year-round nice weather, creates exhausted and injured teenagers. As I mentioned, part of the problem is that young children are still growing and they all differ on timing of puberty. One child’s physique at 14 may be much different than another’s. Obviously, that means that not all kids under 14 can be expected to do 100 push ups at a practice—or whatever benchmarks certain coaches have. Physicians emphasize, however, that it’s not varying from routine in sports that can create ACL injury and even alter bone growth in children’s hips. It’s just not safe on ligaments and muscles and bones when repetitive motions are done year-round. So the kid that focusses on one sport early on and joins a club team that doesn’t allow for proper breaks year-round, will likely sustain “overuse” injuries. This kid who loves the game, and whose parents may have fostered hopes for scholarships, might actually not be as competitive in high school as the child who only played six months a year, took breaks, and enjoyed a variety of sports. It makes sense. Physicians whose studies show pediatric overuse injuries rising, have helped organized sport organizations create limits: such as a baseball pitching limit per season. 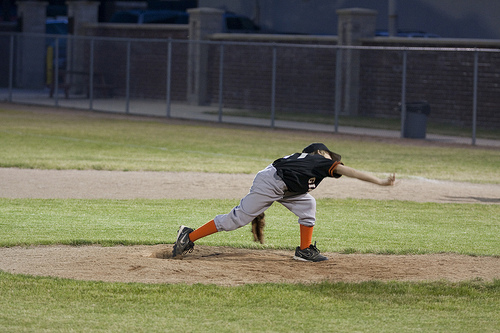 According to a New York Times article on the topic, Little League has established pitch count limits per game and recommended days of rest for pitchers ages 9 to 18. The United States Cycling Federation has imposed gear-ratio limits for riders ages 10 to 16. U.S.A. Swimming recommends the number and length of weekly sessions for various ages of competitive swimmers. Youth soccer fields are now smaller and baseball bases put closer together for youth games. Dancers and gymnasts put in grueling hours and sometimes starve themselves to meet their coaches favor. We all know stories about kids who work hard to become Olympic hopefuls or college athletes. It’s encouraged by parents. And while I’m a huge proponent of getting kids in team sports and off the couch—pushing to the extreme is not a good option. Early injuries lead to earlier bouts of arthritis. Shouldn’t we just get back to the basics and have fun? Don’t we want to foster a lifestyle that embraces a lifetime of athleticism and healthy choices? And is it just me, but wouldn’t it be nice to bring back family dinner for at least two weeknight evenings instead of racing from practices to games and ordering in fast food? Seriously, how well are we really teaching our children to take care of their bodies? 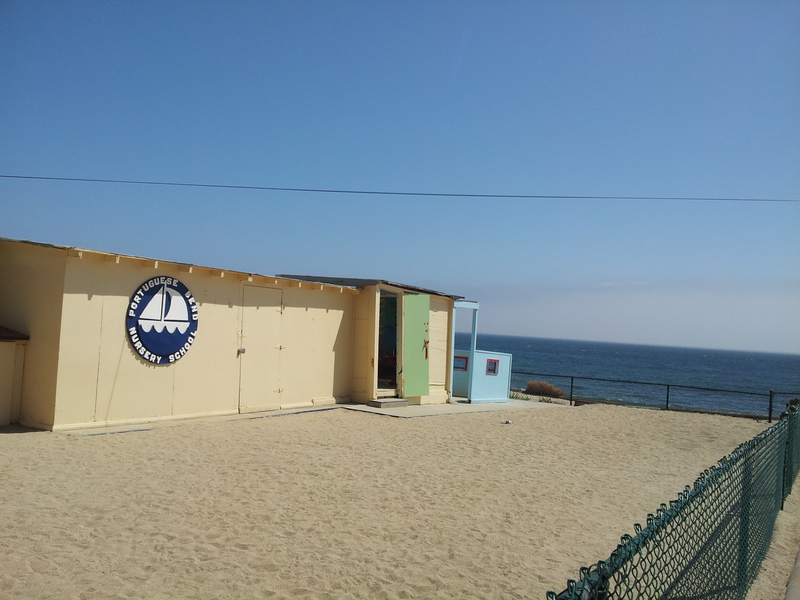 Life in California—especially in a Southern California beach town—is dreamy for kids. Or so it should be. We have gorgeous stretches of sandy beaches, strewn with volleyball nets and a strand for bikers to ride safely for miles. Our town has plenty of parks and violent crime is low. We literally have beautiful weather nearly year-round. 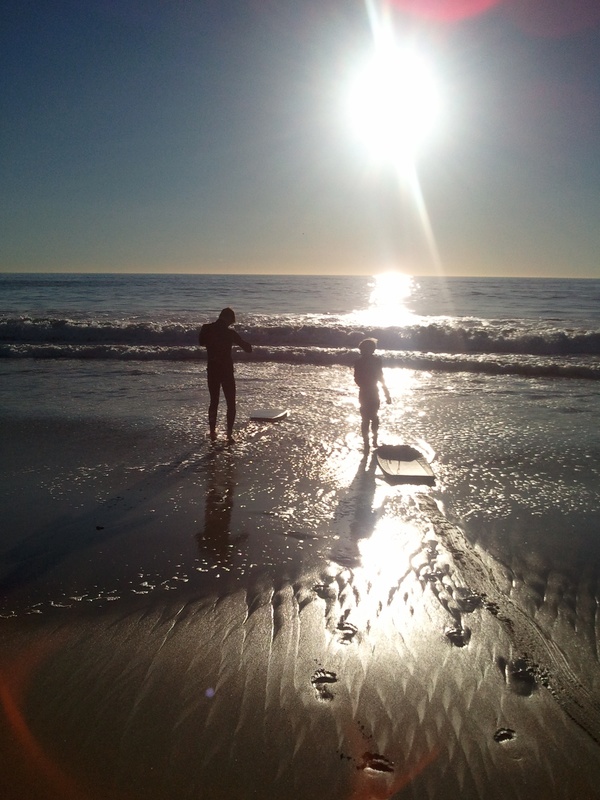 Yet, my oldest cares more about video games than a day at the beach. Getting him to ride his bike or skate board or kick a soccer ball with his buds in the alley (we live in a beach house without a yard, but share an alley with loads of families with kids) takes an olympic effort. He’d rather stay inside and play Minecraft. So I bought a pingpong table and that’s helping a bit. That’s just one issue I’m battling right now. Some days it seems that there just isn’t enough of me. I need at least two clones in order to be a better parent. I’m guilty of juggling my two boys and their drastically differing needs (and of course the loud three-year-old tends to get most of the attention) with other issues such as work and any social life. I’m not always there for both of them the way I’d like to be. (I’m sure my single parent friends and readers empathize with this feeling!) So, I’m inspired to come up with my own list that I hope will help my boys become sensitive and caring men—regardless of being raised in LaLa land! 1. It’s okay to get angry, but it’s not okay to hit. Life isn’t meant to be fair. You are guaranteed to get disappointed and frustrated when things don’t go your way. It’s okay to punch a pillow, talk with a friend or write in a journal about your disappointments. Hitting your brother, your friend or your mother is never ok.
Don’t go looking for trouble, as my mom used to say, but if someone is bullying you or threatening you, you have every right to stand up for yourself. Tell the person to stop, and/or get a teacher if it becomes violent. If that makes it worse for you, remember, bullies are weak. They thrive on putting other people down. Do not believe a word that person says about you and please tell me about the situation. I’ll always listen. I’ll always be in your corner. Remember you’re own worth. You should never put up with abuse. Always think about how your words and actions affect others. If someone at school is annoying you, or if a friend starts gossiping about another kid, try your hardest not to say anything nasty or join in on the gossip. Putting other people down does not make you look better. Find other ways to deal with it. Think about how you would feel if you were that other kid. We don’t always do everything the way we intend to. If you over-react or say something rash, just apologize. It’s not a sign of weakness. In fact, it is usually all you need to do to make things better. 5. You are special because of who you are: not what you have. Just because some neighbors and friends have more expensive toys than you, does NOT make them better. You are kind, smart, caring, loving, creative, curious, fun and inventive. These things aren’t created by owning a huge flat screen T.V. or a swimming pool. Sure, you’d like to vacation in Hawaii and drive a sports car one day—but don’t pursue a career just because it earns a lot of money. Do something that sparks your interest. If you love science or history, keep studying that in college and find a career that incorporates your passions. You’ll never regret being happy on the job and you’re more likely to be successful. 7. Be a team player. It’s just as important to block a goal as it is to make one. You’re not always going to be the player who makes the most goals or baskets. But that’s okay if you’re giving it your all, supporting your teammates and HAVING FUN. 8. Don’t curse like a sailor. Sure, sometimes things slip when angry, but don’t make a habit of cursing. It’s crude, rude and makes you look unintelligent. 9. Be Confident and Don’t Give In To Peer Pressure. Just because some surfers are getting high every day before and/or after school, doesn’t mean it’s a good choice for you. And drinking and driving is NEVER Okay. I love you. Call me and I’ll always come get you or pay for a cab. We all tell those white lies occasionally, such as: “thanks for inviting me,” even if you didn’t have a good time. But don’t lie about the big stuff and especially not to your mom. 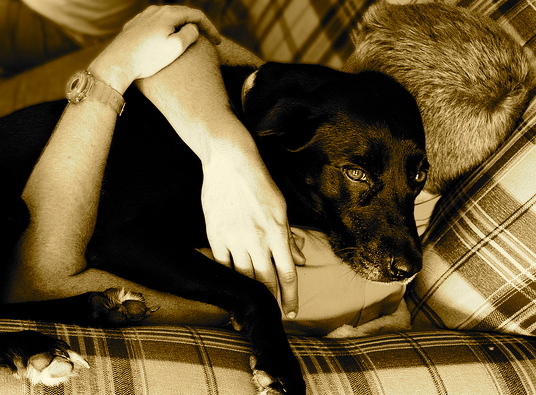 She’ll always listen and try to help you—even if you are in trouble. She will never stop loving you. You will always have a home here, no matter what you do. So don’t be afraid to tell her if something’s gone wrong or you’re in a bad situation. She’s made mistakes too and can help. 11. Always be Courteous to Parents. Say “nice to meet you,” shake hands, and look parents in the eyes when you are visiting a friend’s house. Do not EVER just walk into a friend’s room when you are teenager without addressing the friend’s parents. When you leave, say, “Nice to see you again,” or “Thanks for having me Mr. & Mrs. so and so.” Good manners NEVER go out of style. Remember that true beauty comes with integrity, intelligence and kindness (a sense of humor is a plus too!). If the gal you like is gorgeous, but is lacking in these other qualities, move on. By now you’re sick of hearing me ask you to say what you’re thankful for each night at bedtime, but keep doing it. Letting your mind drift towards what is good in your life, instead of what is bad, brings more good to you AND helps you feel safe and happy. 14. Meditation Isn’t For Sissies. Staying active is great, but finding a way to connect your mind a body through your breath, reduces your stress and allows you to think calmly about your goals and intentions for your life. The sooner you learn this, the better off you’ll be. Sit still for five minutes each night or morning and focus on deep breathing while you let your mind drift to a positive, relaxing location. 15. Eat Something Fresh and Green Every Day. The secret to staying healthy is avoiding junk food and remembering the simple rule of eating raw fruit and something green every day. 16. Get Lost in a Good Book. There’s really nothing like finding yourself transfixed by a good book. In today’s hectic world where everyone multitasks, I will know I’ve done a good job if both of you can find yourself, at some point every year, lost in a marvelous novel. 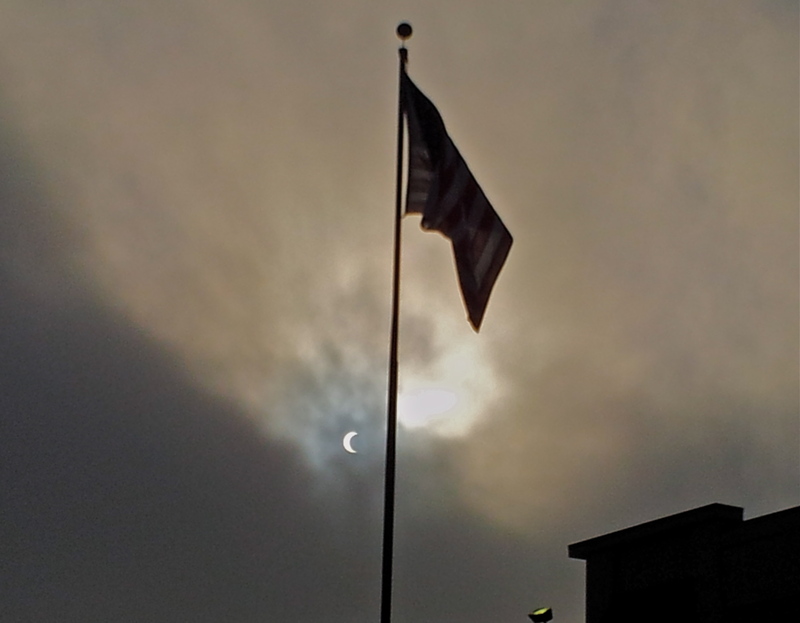 Yesterday was the first solar eclipse in Gemini, the first solar eclipse visible in the United States, in 18 years. 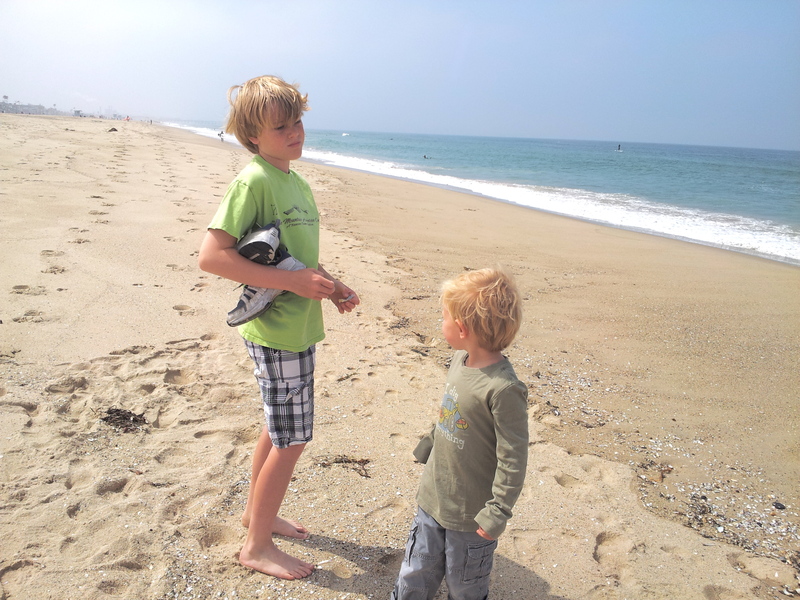 After much wrangling, I managed to push the boys out of the house for a morning stroll, looking for shells, on the beach. 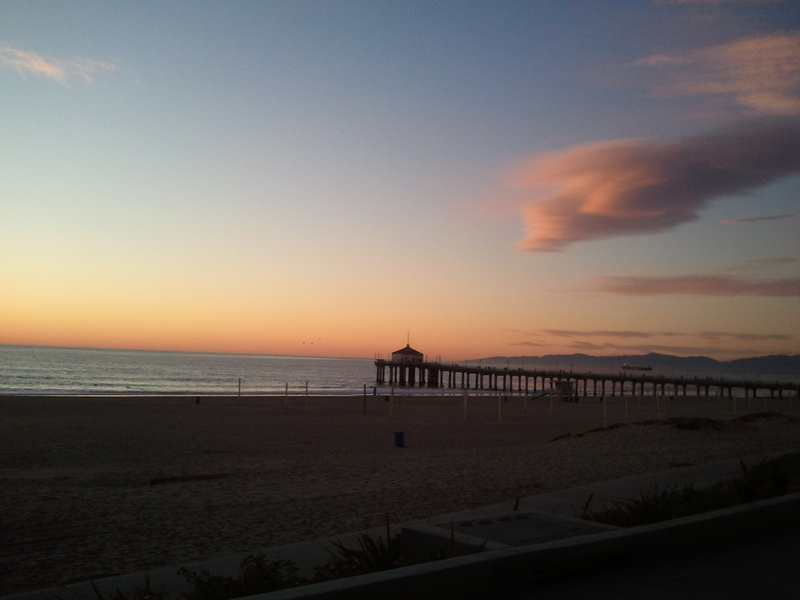 It was beyond wonderful as I walked, free of my boot/cast, feeling the warm sand on my toes. Even though we were having a chilly, over-cast morning, the warm sand, and sweet conversation about shells, felt delicious. 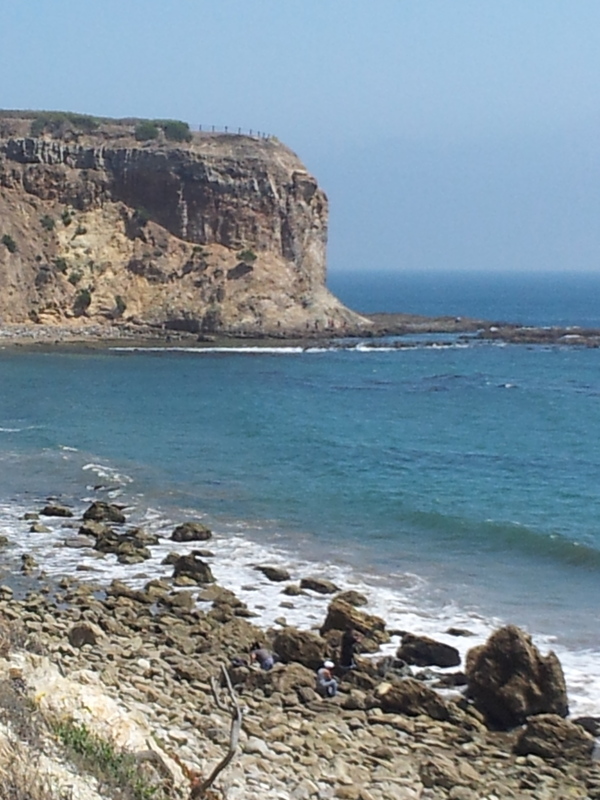 From there, after a lunch playdate, we took a drive south to Palos Verdes while my youngest napped. As we drove, the haze and fog lifted and inspiration hit. 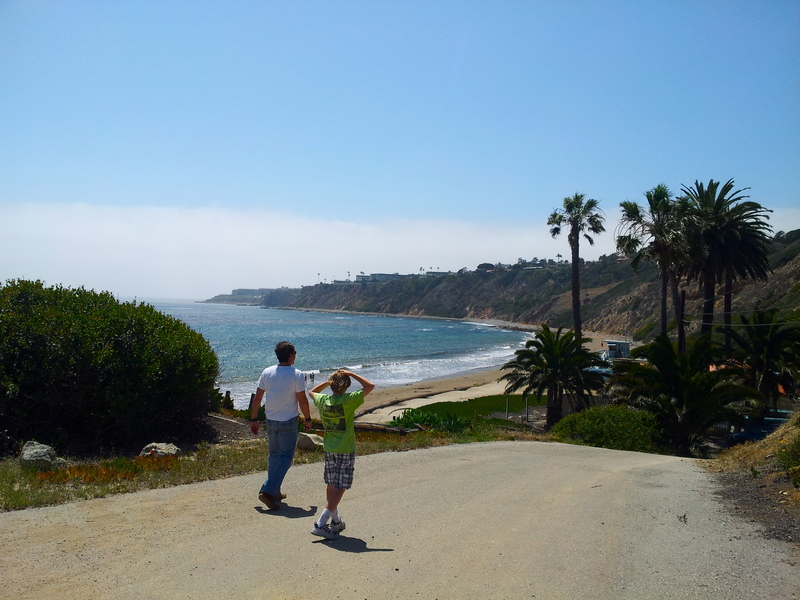 After driving south all the way past Trumps Golf Course, we turned around and parked at Abalone Cove. 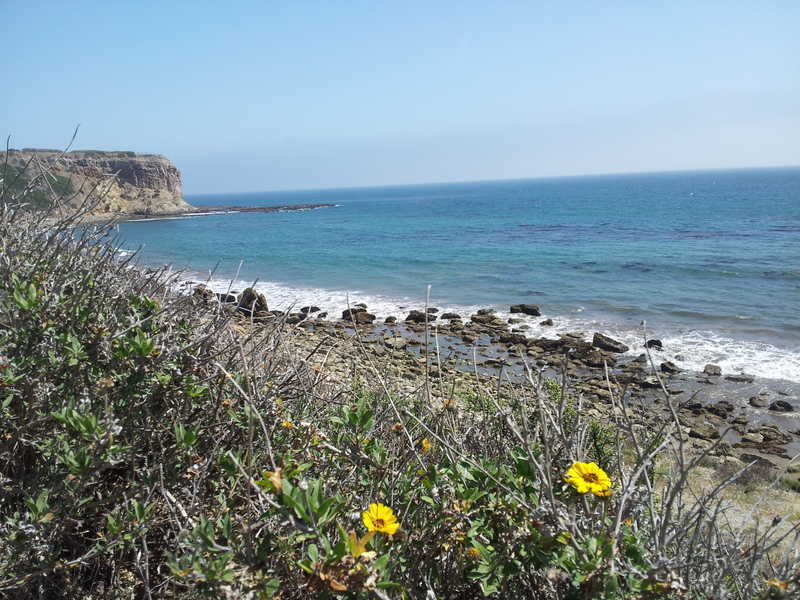 The little one woke up, looking at the yellow flowers and the ocean beyond and exclaimed, “Awesome!” I quite agree. To get down to the cove, we had to hike down a narrow, winding path, that provides the most amazing views of the famous stretch of waters—now world-known from scenes in Pirates of the Caribbean. Do you recognize it? Its beauty is so overwhelming that I kept pinching myself and thinking this could be in the South of France, the Caribbean, South Africa, Portugal, Italy…You get the idea. Every time I stopped to snap a picture, I transported myself elsewhere and got the instant JOLT—the feeling of being on vacation. 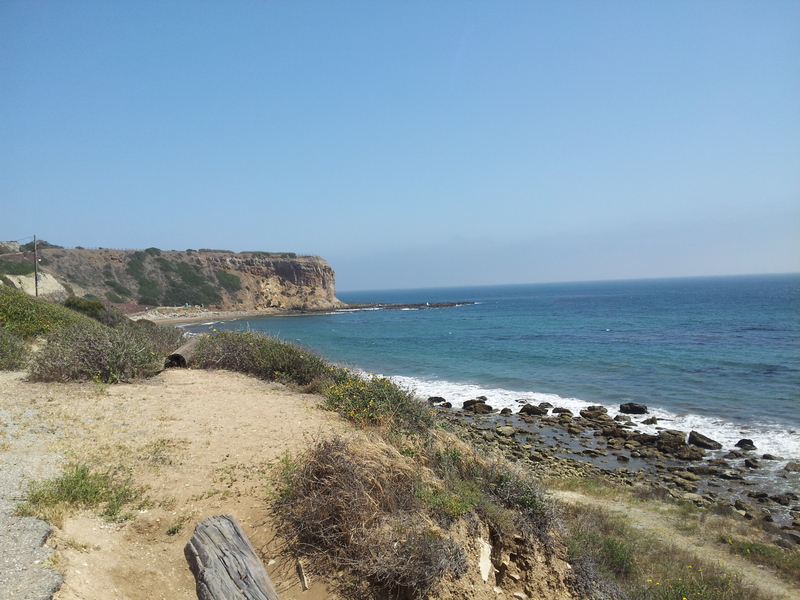 Where else can one get that feeling, then taking a drive or a hike along the coast of California? JUST another stroll on an average Sunday. 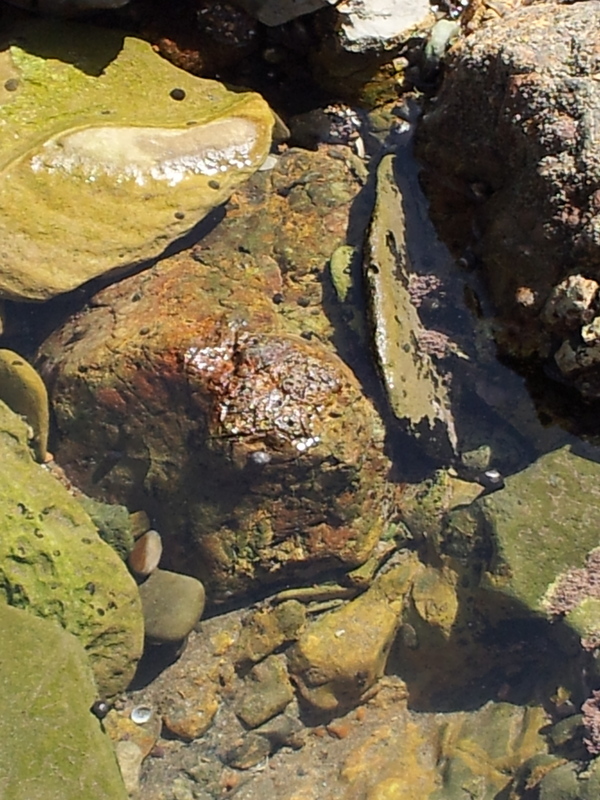 The best part of being in Abalone Cove is that it is literally teeming with life. 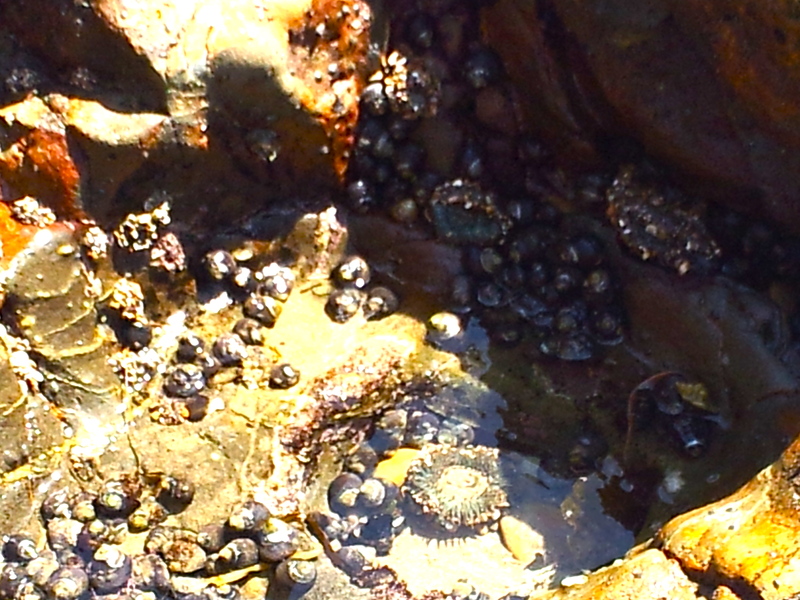 It’s tidal pools are filled with sea anemones, crabs and snails. 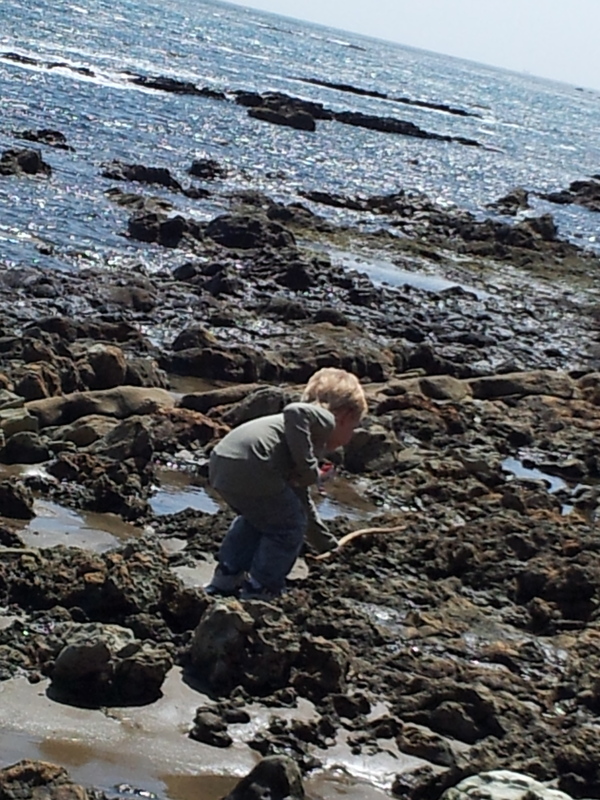 Watching my little guys explore, discover and scurry up rocks made me happier than I’ve been in ages. This is what kids are meant to do. 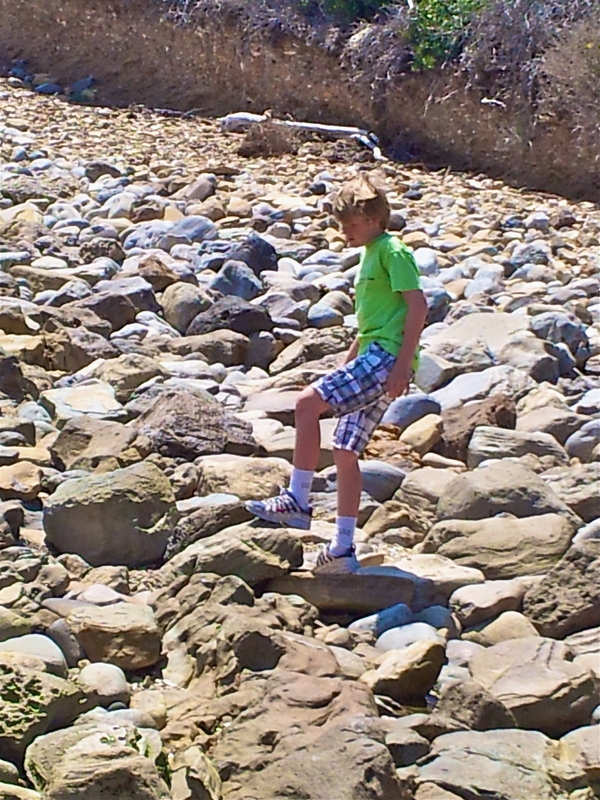 What is it about boys and rocks? Want to feel like a kid again? 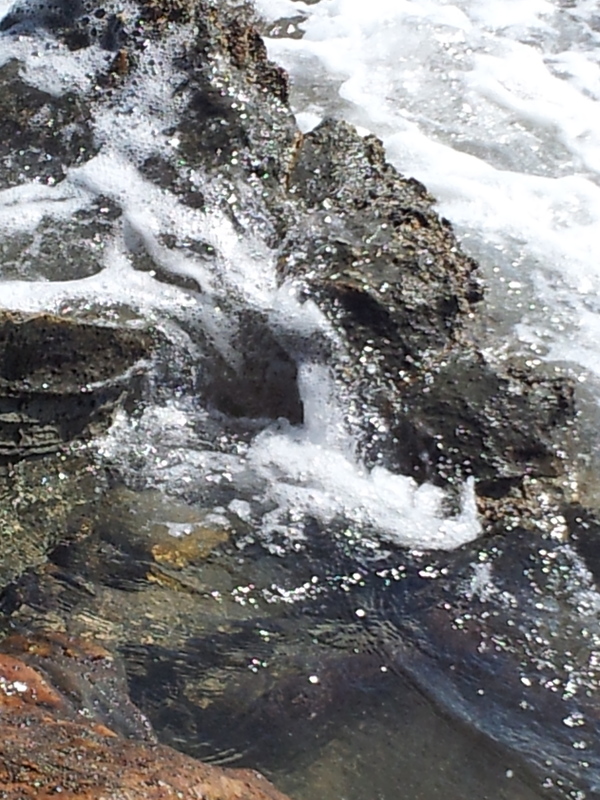 There’s nothing better than exploring and discovering life in a tidal pool. My heart soared as I watched and listened to my boys exclaim: “I found one! 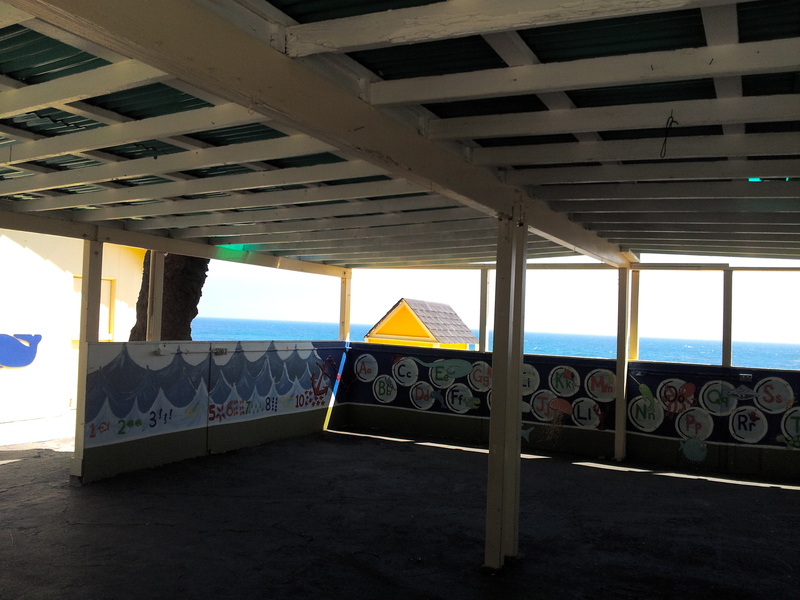 Look at this!” when pointing to sea anemones, crabs or snails. What a day. So full of life, color, vibrancy. Wouldn’t you like to go to class here too? Yes, this is in America. Wow, I want to play too. One last look goodbye before heading back to the car. May 20, 2012 will not be easily forgotten. 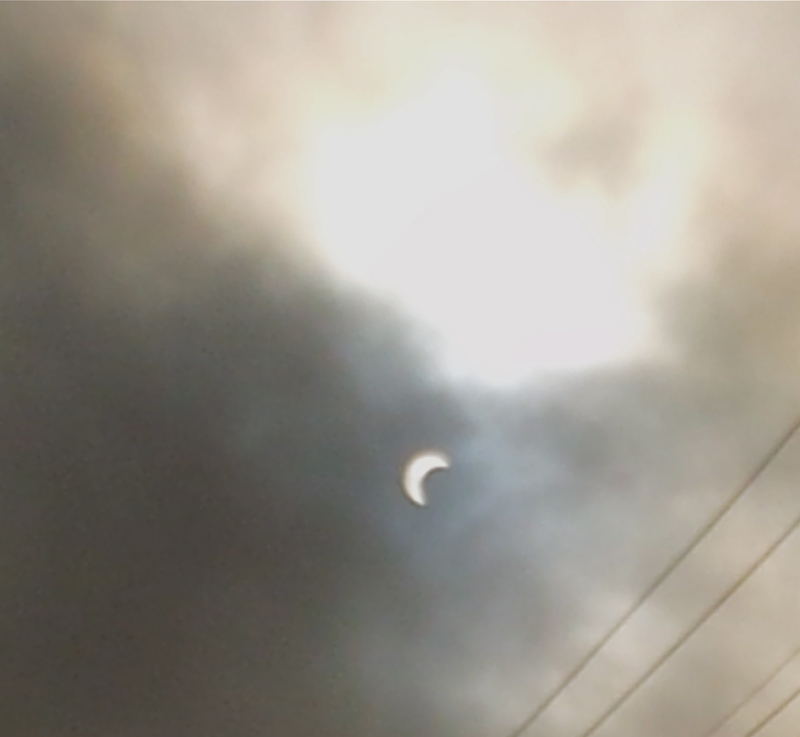 Later that evening, while in the car, I shot this amazing picture of the solar eclipse with my phone. What a lucky girl I am! As many of you may know, I used to live in London and traveled quite a bit. 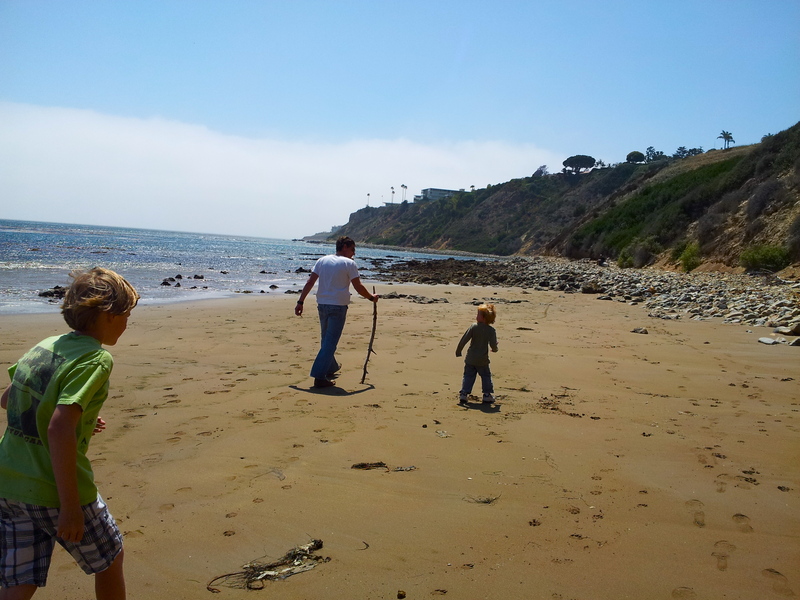 I moved back to California in the summer of 2008, when 7 months pregnant. 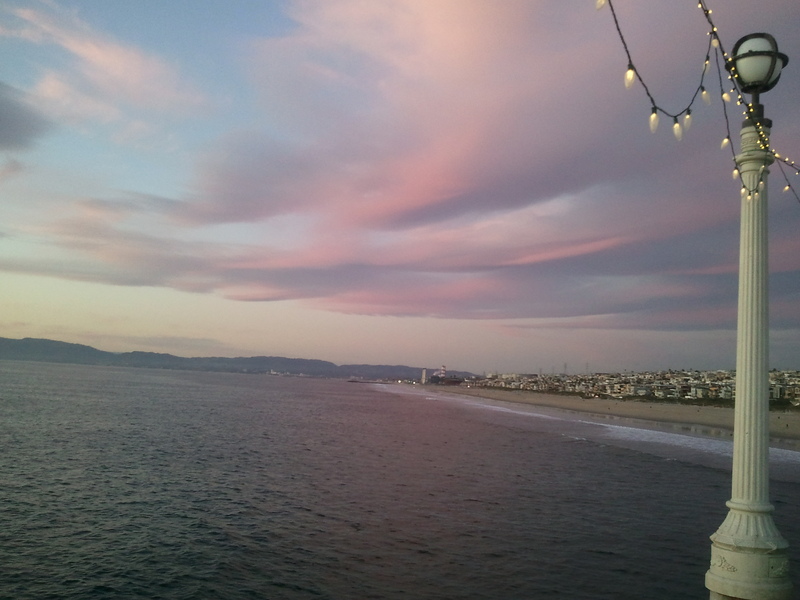 Southern California is a great place to be when you’re sleep deprived and in need of sunshine and fresh air. But lately, I find myself starting to get that twitchy foot. The itch that, in the past, would make want to purchase a last minute rail ticket for a weekend excursion to somewhere in Europe. Now, don’t get me wrong, I don’t miss my old life at all. I really do believe that I was supposed to go through this mess: this divorce, this single motherhood thing and that it’s all part of a plan. It’s forcing me to grow and realize my inner strength and I have embraced that better things are yet to come. BUT, that doesn’t mean that I don’t sometimes need to GET AWAY. Don’t worry, ya’ll. I’m not about to do that. 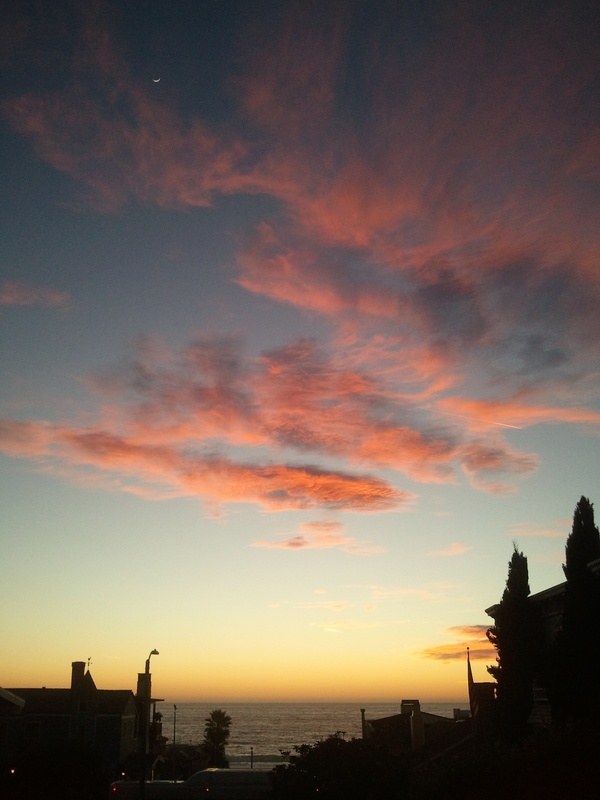 But I realize that I need vistas. I need to explore. It’s always been a part of my DNA. My Ex hated that I rarely planned or structured our trips beyond arranging a house swap or renting a flat or house somewhere. I liked to meander and discover things—to sit at cafes and people watch or talk with a chatty local and get the low-down on where to go that evening. I miss spontaneity. In college, I’d take off and drive from Georgia to Maine with no set stopping places in between. I’d stop where it felt good to do so. I naturally gravitated to journalism as I liked the constant change of scenery or new voices. As a child, I wandered in the woods and horse trails. 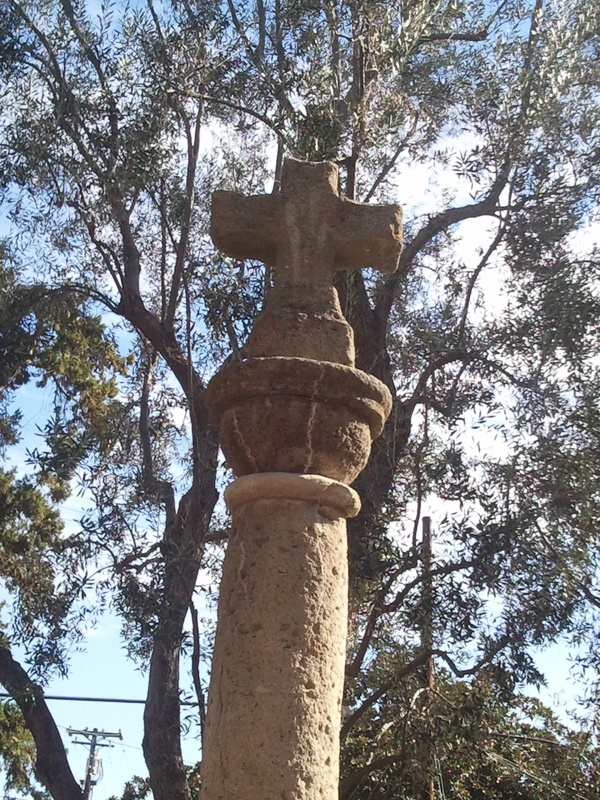 I love discovering by happenstance. With that said, I’m literally and financially too grounded to take off as a single mom of two kiddos. But I’m realizing that I can still get a little bit of that flight feeling by opening my eyes wider and exploring closer to home. 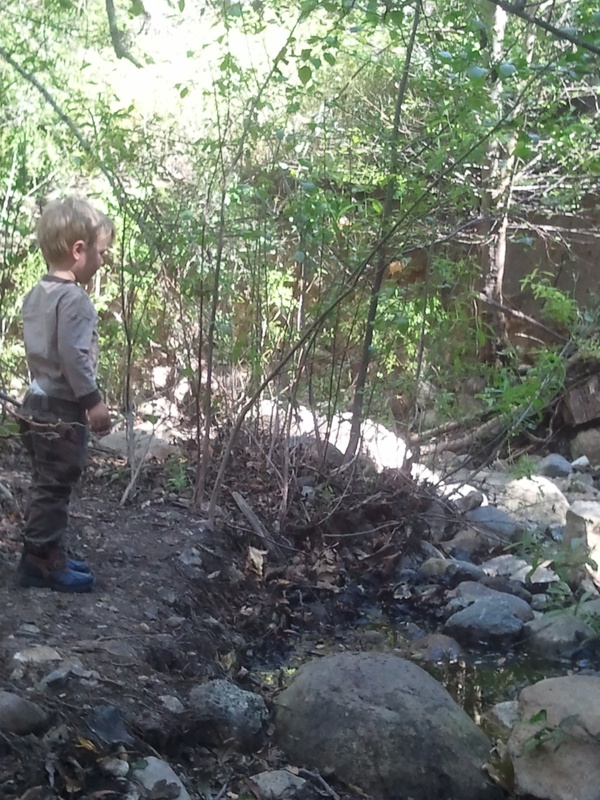 By being present and taking in my surroundings or taking short excursions with the boys, we can explore. So, I’m rarely without my camera these days. I’m far from a photographer, (and none of my pictures were taken with special lenses or have been touched up in some way) but I find that shooting pictures of the beauty that surrounds me in Southern California reminds me there are things to discover in my own backyard. It helps ease that yearning for an excursion I can’t have right now. There will be days ahead for faraway travel. But for now, I’m going to keep drinking in my sun-kissed part of the world. When I take pictures and look at them later, I’ll remember to thank God for second chances at a new life. I am grateful to stay put at the moment. 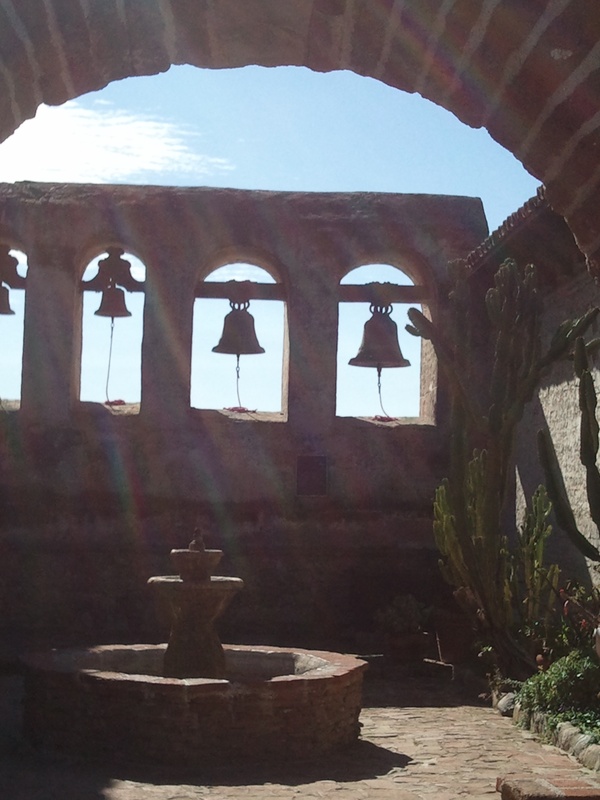 I am grateful to have the time to create and discover what beauty surrounds and lies within.